After the reports on record harvests last summer, peace has once again returned to the European apple market. The market situation is determined by the fact that the storage facilities are full. French exporters saw their market in Northern Europe slip from their hands. Polish exporters had to direct some of their exports to Asia. China does need some apples. The production was lower than expected and the demand is high, so there is plenty of room for imports. In the US, the harvest was smaller than expected, but the market remains calm. The first early apples are being picked in South Africa and Australia. The harvest volume will continue growing in the coming weeks. The first apples will be on the market around February 15th. The season is looking good, with lots of hours of sunshine and enough water. The Cox will be the first variety to hit the market. A week later, the Royal Gala will follow. "We export all over the world, but the Cox mainly goes to the United Kingdom and Europe. The Royal Gala is really for all destinations," says a trader. A company says that the volume of Cherish apples has increased tenfold compared to last year. This apple is shipped to all markets, but most of the volume is intended for Asia. "There is great interest and a good demand for the Cherish," says a trader. Also for the Miranda™, a sweet, green variety which will see its volume double this year. Sales in the first months of this year will determine the European season for New Zealand exporters. There are currently not many Chinese apples on the market and this is due to the bad weather recorded during the fruit's cultivation. As a result of last year's disappointing harvest, the supply is much smaller than in other years, but the demand is still high, so the price for apples is currently higher than in previous years. The export of Chinese apples is also lower than in other years, as the price is no longer competitive enough for the export market and it is more profitable to sell the fruit in the domestic one. Apples are also a popular product to consume during the Chinese New Year, so the price remains high. China imports a lot of apples, and those from Poland have recorded a significant growth this year. This is mainly because of the price of Polish apples being very competitive, and Chinese consumers appreciating their taste. The apples from the United States are also very popular. Despite the high import rates that the government has set for apples, they are still highly imported, because they are very popular amongst the Chinese. Many French apples are also imported, but they are still a little-known product and are now being promoted strongly. 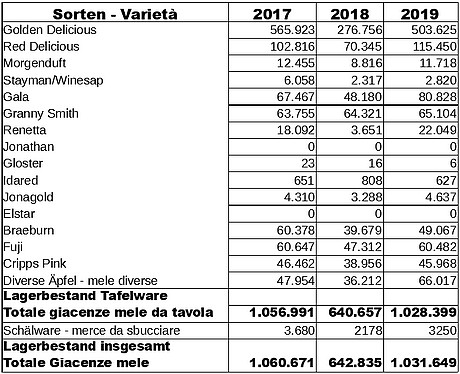 In the first month of the European apple season, the volume of apples marketed has been greater than in 2017, as shown by WAPA figures on European stocks. Sales have gone especially well in Poland, with a record-breaking 385 million kilos in November. On December 1, 2018, 5.1 million tons were in storage across Europe. This is comparable to the figures from 2014. The stock was 44.7% greater than in 2017. The market seems to be recovering from the low prices, but not all problems have yet been resolved. Although the price may still rise, a trader is proud to say that Polish apples are still the cheapest in the market. The price for the processing industry has doubled in recent months, but there is still demand from the processing companies. When it comes to exports, the Polish sector is looking forward to meeting the strong demand from Asia. "The demand is very high and Asian importers are looking for European apples." One exporter says that the Gala Royal, Gala Must, Red Jonaprince and Golden varieties do especially well in Asia. Also within Europe, Polish apples remain popular thanks to their low price. Growers also see opportunities for organic cultivation in the future. At the moment, it is quiet on the French apple market, and this applies to exports, as well. Traders say that sales are stagnating, or even declining slightly. An important reason for this is the competition from imported fruit, as there are cheaper apples from Poland and Germany available. Traders therefore choose to keep the apples in storage and only sell when the market actually needs them, which is unlikely to happen before February. Prices are stable compared to last year. What is different is the export position of French apples in Northern Europe. Countries such as Belgium and Germany are self-sufficient this year, so there are hardly any export opportunities for the French. In general, traders are satisfied with the quality of the fruit. The Gala, for instance, has benefited from the warm summer recorded last year, so the coloring is better. Other varieties, such as the Sainte-Claire, have suffered more from the heat. The German apple market is mainly dominated by domestic apples. The most common varieties are the Elstar, Jonagold, Boskoop and Braeburn. There is usually also a good supply of Italian Granny Smith and Golden Delicious, as well as French Pink Lady. The Red Delicious, however, falls slightly back after the turn of the year. The supply in the German wholesale market is completed with Belgian Braeburn and Dutch Elstar. After a slight revival around Christmas, consumption and prices have declined again: The next two weeks will be decisive for the further development of the campaign until the end of the season, according to a trader from the Bodensee area (South Germany). Another issue that traders are concerned about is the poor storage quality of domestic apples, mostly due to the warm temperatures during their cultivation. For that reason, traders hope for a little more movement in terms of consumption and, consequently, rising prices. The sale of Boskoop apples went very well in the last week of 2018. For the Elstar and Conference, Dutch traders expect a slightly growing and more stable market in the coming weeks, given how the main goal for many at the start of the New Year is to eat healthier. The sale of apples has mainly become a domestic affair. According to the figures that WAPA published about the 2017/2018 campaign, the Italian harvest volume stood at 1.7 million tons; an increase of 30%. Nevertheless, this volume remained below the five-year average of 2.2 million tons. In December, Europe had the biggest stocks ever reported. Assomela and the Chamber of Commerce in Bolzano published stocks figures for Trentino Alto-Adige on a monthly basis. On 1 January, there were 1,031,649 tonnes of apples in storage, compared with 1,060,671 tonnes in 2017 and 642,835 tonnes last year. This volume consists mainly of Golden Delicious (503.625 tons), Red Delicious (115.450 tons), Gala (80.828 tons), Granny Smith (65.104 tons), Fuji (60.482 tons), Braeburn (49.067 tons) and Cripps Pink (45.988 tons). The season has just started in the north of Limpopo with local varieties able to withstand the heat. Soon, the Royal Gala's from the east, Free State and Mpumalanga will also hit the market. The bulk of the apples come from Western Cape and Langkloof. In 10 to 14 days, the harvest in those areas will start with the first Royal Gala and Panorama Golden. The water supply is better and growers are more optimistic than last year. The season is starting this month with the early varieties, including the Royal Gala, Smitten and MiApple. 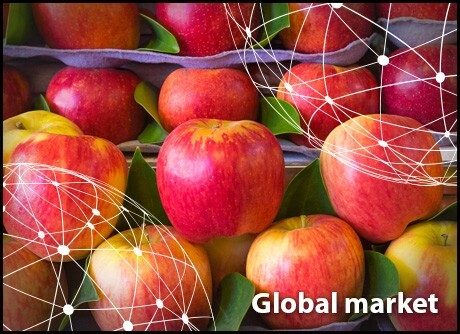 Apple and Pear Australia Limited (APAL) has invested a lot in promotions for Australian apples in the Asian market, especially for the Pink Lady. Although the organization admits that access to the Chinese mainland will take some time, the third visit to China in 12 months was recently completed. With this, the organization is committed to speeding up the process by showing the Chinese the benefits of Australian apples. During the summer, some growers have had to deal with difficult weather conditions. In several regions, including Adelaide Hills, the crops were hit by hail. Every grower in the area saw their harvest damaged by it. In Orange, New South Wales, 20 millimeters of rain fell overnight in just 15 minutes. The growers who had no nets over their orchards were the most affected by this. A trader points out that the harvest in Washington is disappointing this season. In fact, it has been 25% lower than initially expected. It is difficult to pinpoint a clear cause for this, but some point to the frosts recorded in the winter. The Granny Smith is the most affected variety, while the Honey Crisp is recording growth thanks to an acreage expansion. Other growing areas in the US seem to be doing OK. Michigan and Pennsylvania have had a good harvest, but they have not hit the market as early as in other years. "Washington focuses on cultivation for the fresh market, so everything that grows there is packed for supermarkets," says a trader. The demand is good. The Gala, Fuji, Pink Lady and Granny Smith are all doing well in the market, according to a trader. The market for Red Delicious is under pressure from the Galas. Price-wise, there are few changes. "The price for organic apples is good and that for conventional ones stands at an average level, but not high," says a trader. Given the smaller harvest, the prospect is that the price will rise.